My RATINGS of edible wild mushrooms! My favorite simple recipes for wild mushrooms! A SHORT 'SHROOM PRIMER, my intro to mushrooms! Check out the Featured Forage! Mushrooms are some of the most intriguing organisms around. You hardly notice them until you step on them, and if you're not looking for them you'll never know just how ferociously abundant they really are. 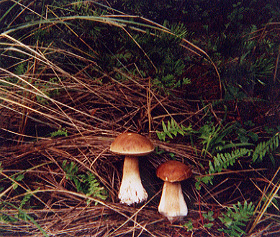 Most mushrooms are LBMs (Little Brown Mushrooms) that defy identification. Even most of the larger ones are unspectacular in color and edibility. Only a few distinguish themselves by being choice edibles, toxic toadstools, or brightly colored little smurf houses. Still, come fall, there are enough of these to make taking an identification class (check with your local community college or parks and recreation department) very worthwhile. I have been hunting mushrooms (yes, this choice of terms always seems to bring a few laughs) for seven years now, and have never tired of finding fungi. Warning: Do not eat ANYTHING (including but not limited to mushrooms) that you have picked, bought, or been given UNLESS YOU ARE ABSOLUTELY SURE OF ITS IDENTIFICATION! I write the above not only as a disclaimer but as an attempt to place fungi on equal footing with other foods. There are deadly poisonous mushrooms out there. There are also deadly poisonous plants. Mushrooms which are edible may cause adverse reactions in some people. So can plants and plant parts (you don't want to hear about my experience with rutabagas), meats, and food additives which are generally derived from plants. It is always best to be educated and cautious. A Short 'Shroom Primer, my own introduction to mushrooms. Besides taking a class or finding a knowledgeable person to forage with, the following book will be very helpful if you live in Western North America: Mushrooms Demystified, by David Arora (Ten Speed Press: Berkeley, 1986). It is truly the mushroom hunter's bible for our neck of the woods. Another book to check out, particularly if you are most interested in eating mushrooms, is Edible Wild Mushrooms of North America, by David Fischer and Alan Bessette. Fischer and Bessette have also written a field guide to Mushrooms of Northeastern North America, which should be out soon and will be an essential guide for residents of that region. The Audubon Society's Field Guide to North American Mushrooms is a good companion with lots of photographs, but I wouldn't want to rely on it alone. Before picking on public lands, it is usually best to check with the local authorities. In Oregon, most National Forests require permits (usually at no charge for personal use) which may have additional restrictions attached, and State Parks ban picking altogether. These regulations have come about only recently, and are mostly the result of a boom in the mushroom export market. With commercial pickers bringing in thousands of dollars a week, it is not surprising that the woods in some places have turned into a war zone. Destructive picking techniques and greedy frenzies hurt the woods and make them a worse place to be; think of it as fungal clearcutting. Recreational pickers have a duty to abide by regulations so that we can distance ourselves from these practices and possibly gain access to a wider selection of lands. There are lots of mushrooms on the Web. If you're looking for a site, check out the mighty lists of links at MykoWeb and mycoElectronica. A truly awesome site for the beginning mushroomer is Mushroom Heaven. Add your name to the list of Mushroomers Online! Visit Dave Fischer's Mushroom Page while you're at it. You can also browse my foray reports and my list of local mushroom species. Although these seem Portland-specific, they should be helpful to foragers in many areas.